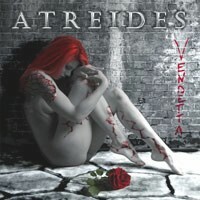 The Italian band Atreides started back in 2004 and was built up from the ashes of Savatage cover band Braindance. And so you get a slight idea what to expect. They kick of with the fast Dune, a track with sharp riffs and an epic touch. The voice of Davide De Meo is dark and powerful, but lacks power when he sings high notes. The guitarists Matteo Mondino and Antonio Allena deliver their riffs precisely and also short lead parts are well done. Even as at one point the guitar lead competes with the vocals - and almost drown them for a moment. But that can be leveled in the mixing. The track Soul Confessor is a bit slower and Davide De Meo's vocals have a majestic touch. Here the second voice isn't working well... Not powerful enough to keep up with Davide. This one is a bit more complex and shows a guitar solo which has a slightly neo-classical touch, but somehow the guitar sound is strange... I guess that's a production problem, something which can easily be fixed in a proper production. The last tune is Atreides (The Curse) and starts off slowly, but then the band kicks in and the tune becomes an up-tempo riff-based epic rocker. Okay, Davide De Meo has to work on his pronuncation a bit, but I heard singers with a worse accent. At this track the backing vocals / second voice is better  then on the previous ones. The guitar solo is very melodic and fits well. Later in the song they have a part which live shall animate people to sing along, but on disc this sing along doesn't really work. This part I would overdo... Or just shorten the track, coz with almost 9 minutes, nobody would miss this passage... And the song ends as it started - slowly.